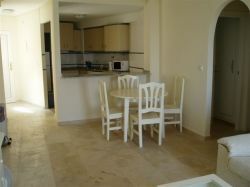 DESCRIPTION:A LUXURY TOP FLOOR APARTMENT self catering with 2 bedrooms,1 bathroom and a shower room. 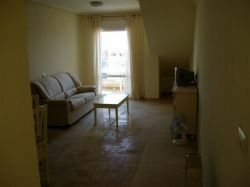 There is a lovely solarium with stunning surrounding views and secure underground parking free of charge. WE PROVIDE TOWELS AND BED LINEN AT NO EXTRA CHARGE. 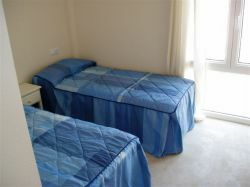 LOCATION: The apartment is LOCATED in Cabo Roig, close to lots of shops, cafes, bars and a large variety of restaurants. You can enjoy your drink in the sun on one of the beautiful terraces, under the palm trees and you can enjoy a delicious meal in a traditional Spanish restaurant or, if you prefer, in a traditional Indian or Mexican one, as all tastes are catered for here. THE BEACHES: The beautiful Cabo Roig and Campoamor blue flag beaches are only a few minutes walking distance away. GOLF COURSES: For the golf lovers , the international top class GOLF COURSES of Villamartin, Campoamor and Las Ramblas lie less than 10 minutes driving from the apartment and there are also other smaller golf courses in the close area. 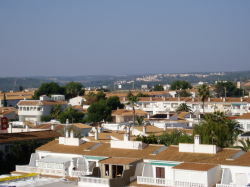 TORREVIEJA TOWN: The Torrevieja town with its sea front restaurants and cafes, promenade and late markets are a 15 minutes drive to the North and the traditional Spanish beach town of San Pedro and Mar Menor is only 10 minutes to the South. Offers for void periods taken!